Interfaith Medical Center came out of bankruptcy on Tuesday, almost two years after filing for Chapter 11. BEDFORD-STUYVESANT — Interfaith Medical Center remains open for business. The beleaguered Bed-Stuy hospital emerged from bankruptcy on Tuesday, ending a year-and-a-half-long battle to keep it open and financially solvent, hospital officials said. 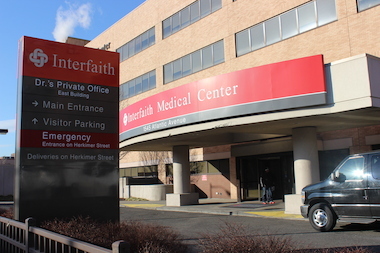 A federal bankruptcy judge on Monday approved the hospital's restructuring plan, which will replace senior management with a new state-mandated management team in return for state funding to keep Interfaith open, the hospital announced on Tuesday. "We set out to save Interfaith Medical Center," read a statement from Interfaith board member and IM Foundation President Diane Porter. "And today, I am enormously proud to say that it is a new day for Interfaith Medical Center and the people of Brooklyn." Chief Judge Carla E. Craig postponed two previous hearings to finish settlements with creditors and other financial interests. As part of one such settlement, the IM Foundation agreed to contribute at least $750,000 to a fund for malpractice claims against the hospital, and surrender ownership of two parking lots currently used by the hospital in return for property at 515 Herkimer St. and both 276 and 278 Nostrand avenues, a foundation spokesman said. The deal was finalized on Tuesday morning, a hospital spokeswoman confirmed. The hospital, which serves a large low-income population, went into bankruptcy in December 2012 after years of financial trouble stemming in part from a 2010 reduction in Medicaid reimbursements. Since then, the hospital has been on the brink of closure on at least two separate occasions. Last-minute temporary deals saved the hospital from the chopping block. As part of the new plan, the hospital's appointed Chief Restructuring Officer, Melanie Cyganowski, will transition into the hospital's temporary operator while Steven Korf remains C.E.O. “This process allowed Interfaith Medical Center to restructure its financial obligations and emerge stronger to enable it to continue to provide high quality health care to the people of Central Brooklyn,” read a statement from Cyganowski. In addition to Cyganowski and Korf, Interfaith announced Robert Mariani as hospital C.F.O. and a new board of trustees that includes Paul Francis of the Cedar Street Group, Dr. Ruth Browne of the Arthur Ashe Institute for Urban Health and Michael Irwin, managing director of Citigroup health care financing. Freedom from bankruptcy will allow the hospital to apply for part of an $8 billion state Medicaid waiver. But the hospital's next step is to hire new staff and reach out to the community after a recent loss in patients and employees due to the hospital's uncertain future, Cyganowski told DNAinfo New York last month. "It has been a difficult road but Interfaith Medical Center stands proud and welcomes the people of Central Brooklyn to use its medical facilities for primary and urgent care," Cyganowski said. "Our clinics stand ready to assist everyone for whatever the need."